The woodcarver's knife is an extremely useful and versatile tool, which can be used very effectively for any number of technical applications. For example: cutting complex curves, deep wrinkles, creases, separating volumes of mass, cutting into awkward corners and producing infinite cuts, which would otherwise require a variety of gouges of varying sizes and sweeps to achieve. 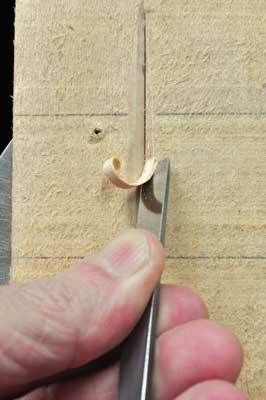 It is therefore in the interest of every learner to start getting to grips with this valuable tool, in line with their gouges and chisels, as soon as they take up the art of carving. Knives are, however, one of the more difficult carving tools to master due to the fact that they are predominantly held in one hand. Also, the nature of their blade and how it is technically applied to the medium of wood is very different from any other tool, which can put off the learner. They have a high tendency to slip if not used correctly, or at the right angle, and kept in razor sharp condition, which can obviously be very dangerous. 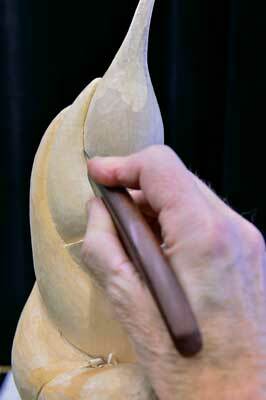 It is therefore vital for the beginner carver to apply themselves to learning how to use the tool safely and effectively, adopting a code of good practice by following several fundamental rules as outlined in this article. This will facilitate progressive and safe advancement and the ability to extract the full potential of this highly valuable versatile tool. 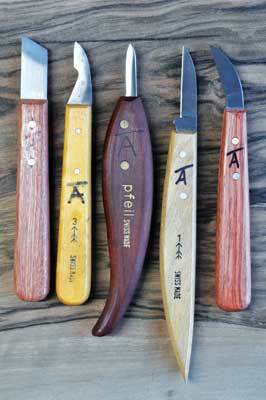 There is a huge choice of woodcarving knives that are available from specialised tool manufacturers and dealers, which can be found in a variety of shapes and sizes for numerous applications. Many of these are quite useless for beginners unless you intend to use them for the practice of whittling, which is not the intention of this article. We are of course all very different in terms of the fine anatomical structure of our hands, so essentially what handle or blade length suits one person won't necessarily suit another. However, I have observed through my experience of teaching over the past two decades that a very high percentage of learners advance very quickly using the shortest blade length knives. My theory is that the nearer the cutting tip is to your finger grip on the handle, the more directional control you will have over the cut or slice that you are making. 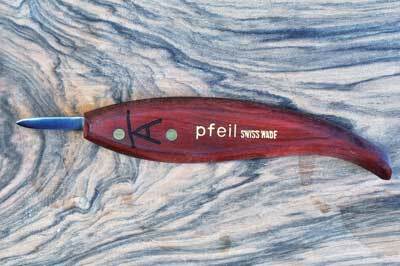 Therefore my recommendation for an appropriate first knife to purchase would be the Pfeil Small Schaller knife - 30mm blade - or similar. This has excellent balance in use, a beautifully designed ergonomic handle and a rounded back edge on the blade - crowned - which further facilitates the accurate directional control of cut through the grain. 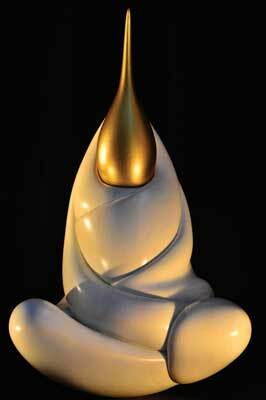 It is my belief that we all naturally develop our own way of holding and working with our tools and is certainly something that I encourage as a tutor. However, it is also very important for students to initially learn the orthodox methods from day one, so that they have a good understanding of how to control them effectively and safely, and then develop their own individual style and techniques from this grounding. As fortune would have it our senses are already very well calibrated with the technique of directional control, which we learned to do from our early childhood when we were introduced to drawing and writing with pencils and pens. 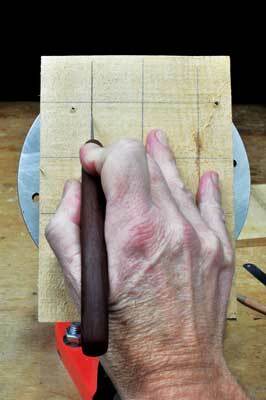 This directional control is essentially the same technique as we use for slicing into wood with a knife, albeit a much smoother process with a pencil. 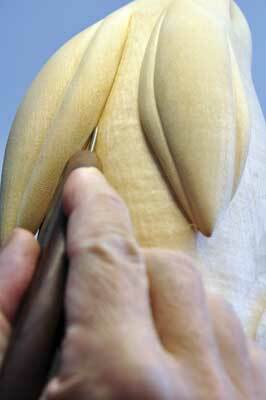 Therefore the same method of holding the knife should be adopted when making cuts and slices into wood. Practice this by gripping the handle as near to the blade as possible in the same way as you would hold a pencil, and then curving the blade from side to side in the air as if you were drawing a continuous 'S'. When working with the knife you must always ensure that part of your hand is in direct contact with the surface of the wood at all times. This is vitally important for your safety, and equally crucial for optimum balance, control and accuracy over the cut you are making. 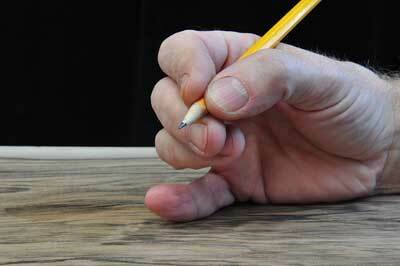 There are two main techniques for this hand contact that work effectively in most situations: the first, with the fourth and little fingers in combination together, splayed apart and pressed firmly on the wood; the second, the side of the palm and/or edge of the wrist resting on the surface of the wood. 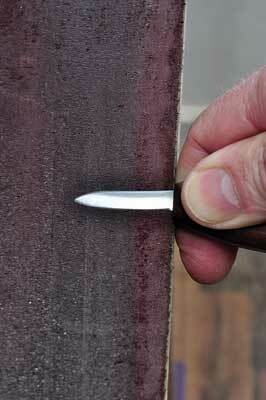 Always make your initial knife cut fairly shallow as this will mean that there is far less chance of it slipping. It is also much easier to follow your design line with directional control if you are not pressing too hard. This initial cut is what I call a tramline, which can then be followed much easier by subsequent cuts with increased pressure if necessary to produce the detail that you wish to create, but with a far reduced chance of the blade slipping out of this tram/design line. 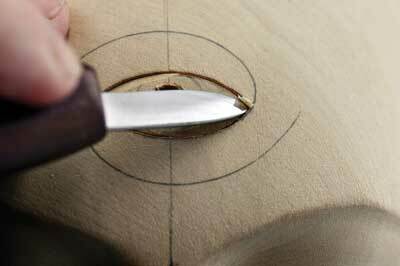 When using the knife to slice over a curved surface, it is essential to keep the cutting point of the blade at the same angle as you work over the contour. This is achieved by raising or lowering your hand/wrist/arm at the same degree as the contour rises or falls, which ensures that the cutting point of the blade remains safely in control and in contact with the surface of the wood. 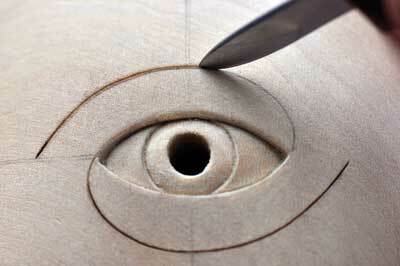 If the angle of the cutting point is raised too high when under pressure, then it will slip in a blink. Knives and V-tools are arguably the most dangerous tools to use by far, as the nature of their design and application have a much higher risk of 'slipping' when in use, especially if they are not razor sharp. It is therefore vital that the blade must be stropped each and every time after you make a cut so that this risk is minimised. If you routinely adopt this rule of good practice then it will not only keep you safe it will also quickly help you to advance your skills and confidence as you will be able to extract the full potential from this extremely versatile tool. Stropping the knife blade, in effect, is polishing the cutting edge to a very fine, razor sharp finish, which is essential for all carving tools and a continuous practice that must be undertaken in order to ensure that they are kept in top condition for use. Most new knives come ready sharpened when you buy them but it is still good practice to give them a quick strop before you start any work with them. 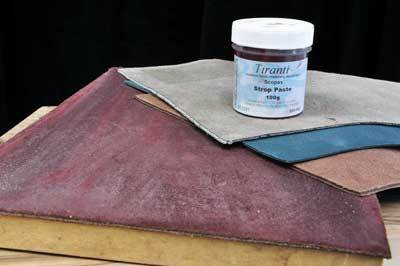 The strop itself is simply a piece of leather, preferably A4 in size, by 1.5-2mm thick, bonded onto a flat piece of wood using PVA glue, with the suede side up. The leather is then 'dressed' with a very fine abrasive paste or soap - 'strop paste' - which is rubbed generously and evenly into the grain of the leather with a cloth. This should last a good few months between applications. These compounds are very inexpensive and can be bought from many specialist dealers, with Alec Tiranti being one of them in the UK. 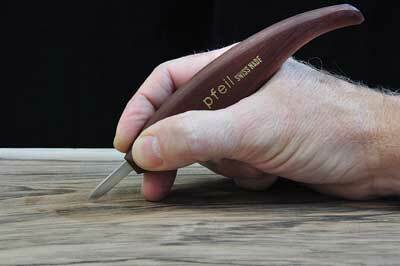 The knife is one of the simplest tools to sharpen as it has no sweep - curve - along its blade. 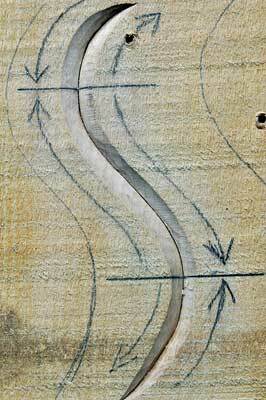 The theory being to ensure that the wear is kept evenly on both sides of the blade along the cutting edge. 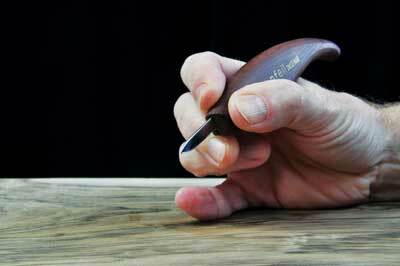 Hold the blade on the strop at the same angle that the side of the blade slopes down to the cutting edge - a few degrees - so that the cutting edge is resting evenly on the leather. Rub the blade edge 10 times along the full length of the strop at this angle, then turn the knife over to the opposite side of the blade and repeat the procedure on this side, thus keeping the wear even and producing a razor sharp edge. 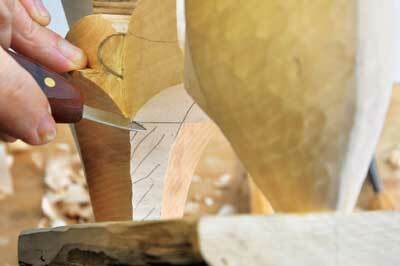 Select a flat piece of wood, preferably lime as it is quite a soft species to practice with. 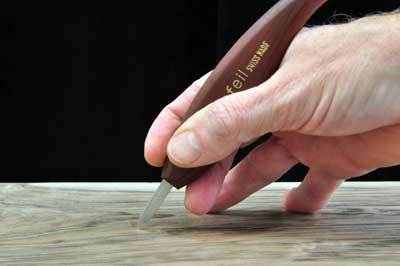 Either secure this to your carving vice or clamp it safely to your bench. Draw several straight vertical lines running in the same direction as the wood grain, and several horizontal ones running across it. Hold the knife firmly between your fingers as you would a pen; just above the position where the handle joins the blade, and make a shallow cut along the line as accurately as you can by drawing the knife from top to bottom. 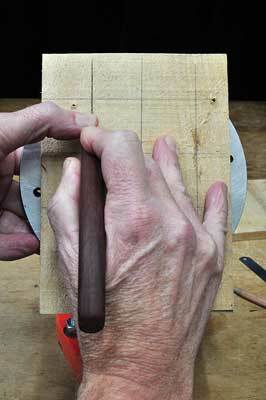 Do this on each of these lines remembering to strop the blade in between each and every cut. Notice how different the cut feels going 'with' and 'across' the grain? When making subsequent cuts into the initial tramline, you can use your thumb or the index finger of your opposite hand to help add pressure to the cut by pressing down on the handle or back of the blade. Now cut into these tramlines again but this time adding a little more pressure to deepen the slice. Notice how much more control you have over the cut working in the tramline? The surrounding area either side of the knife cut can now be pared over into this slice which will facilitate the ability to produce a deeper crease. These procedures can then be repeated as many times as you choose. 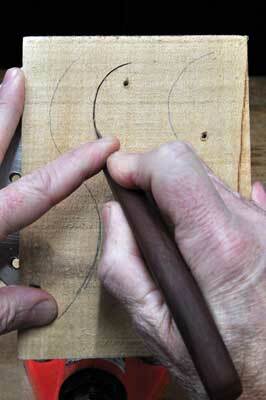 Next, draw several wavy lines onto your wood but not too tight in their curvature. This time use your opposite hand as well to make the initial cut, but not to add pressure, just to aid your balance and directional control. Use the same technique as outlined above to cut these lines but stopping to reposition your hands as soon as it starts to become awkward to follow the design line smoothly. The surrounding areas either side of the knife cut can now be pared over into the slice again, but this time they will be more difficult to carve evenly due to way the design line curves from side to side, across and down the grain. 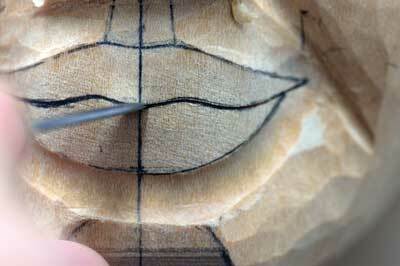 This will require you to keep changing your direction of cut, working to and from the horizontal lines that I have drawn on the wood, following the direction of the arrow markings, which will also give you a valuable exercise in how to approach the wood grain. Keep practising these techniques over several different sessions until your confidence grows, then try the same exercises but over a curved surface, not forgetting rule No.3 during the process. When you reach the stage that you feel inspired to experiment independently with what you have learned then I would very much encourage you to do so. You will then be reaping the rewards of your practice, expanding your technical and problem-solving skills and stimulating your own creative innovations which is exactly the right direction to head for.